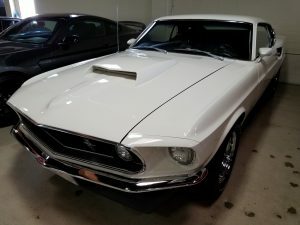 In Zusammenarbeit mit unserem Top Händler aus Kalifornien verkaufen wie diesen echten Mustang Boss 429 S 1969. 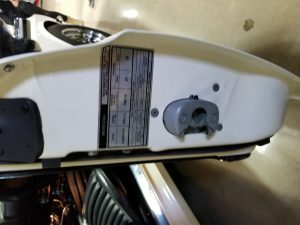 Eines der wertvollsten US Cars aller Zeiten. 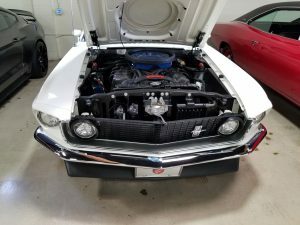 Der ultimative Mustang. 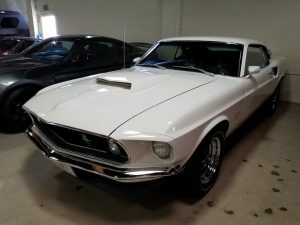 Kein Mustang war und kommt diesem Wagen gleich. 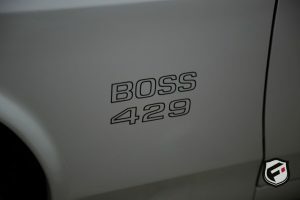 Nur sehr sehr wenige wurden jemals produziert und ein Boss 429 „S“ ist eines der early productions. 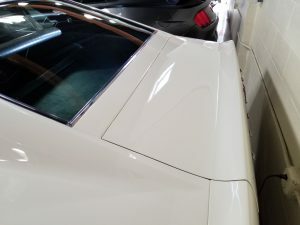 Was es zusätzlich noch wertvoller macht. 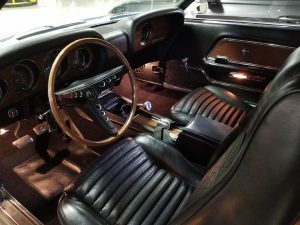 Das Fahrzeug ist dokumentiert und registriert. 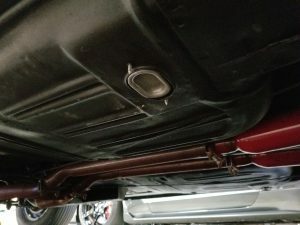 Dies ist Fahrzeug Nr. 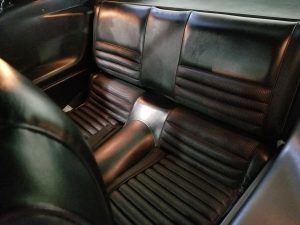 117 aud der Produktion von nur 859 Fahrzeugen. 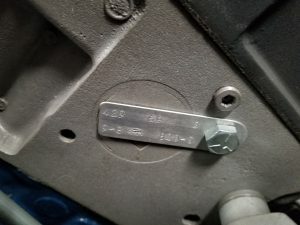 Einen Numbers Matching Boss zu haben ist die Nadel im Heuhaufen. 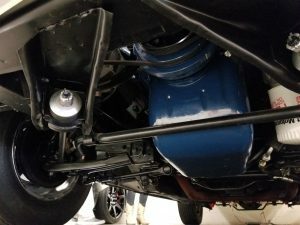 Das Fahrzeug kommt aus einem Museum und wurde seit Restauration 28 Meilen gefahren. 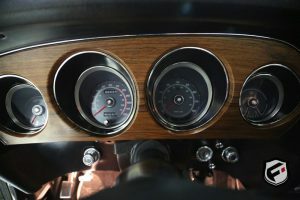 Eine Handvoll dieser Fahrzeuge existiert noch und diese werden mit weit über 400.000 USD gehandelt. 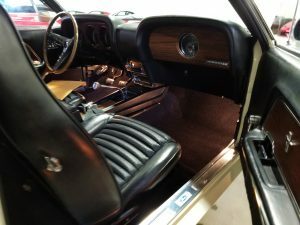 Auf einer Auktion wurde kürzlich eines dieser extrem seltenen Fahrzeuge für 500.000 USD versteigert. 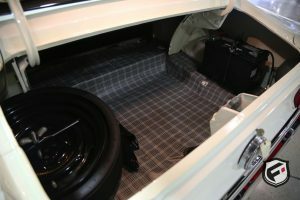 Dies ist das Non Plus Ultra dieser Serie und eine Wertanlage wie Sie kaum besser geht. 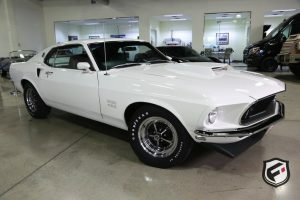 Der Boss 429 / 1969 ist Best of the Best und in einem Top Zustand. 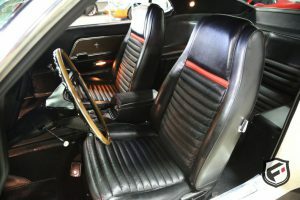 Für weitere Informationen zu diesem außergewöhnlichen Fahrzeug sprechen Sie uns bitte gerne an. 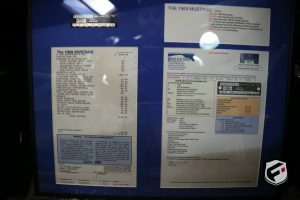 Hier noch einige Daten und Info´s in englischer Sprache. The Boss 429, also known as the „Boss 9“ by enthusiasts, is arguably one of the rarest and most valued muscle cars to date with only 859 made in 1969. 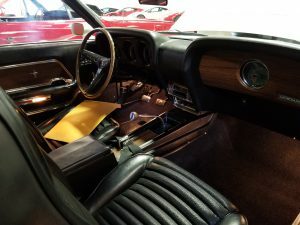 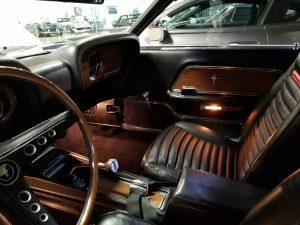 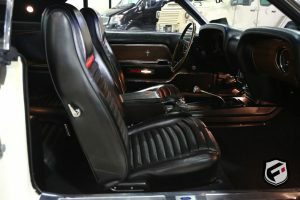 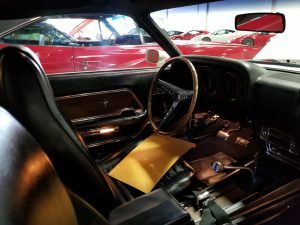 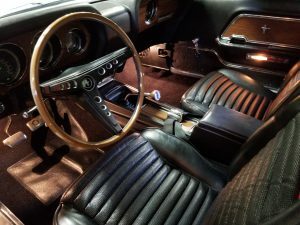 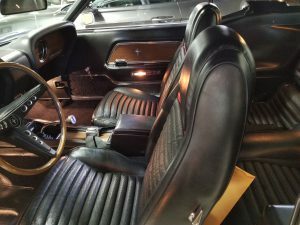 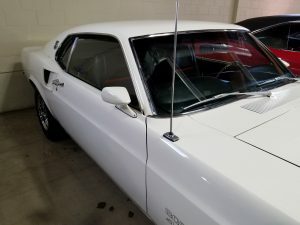 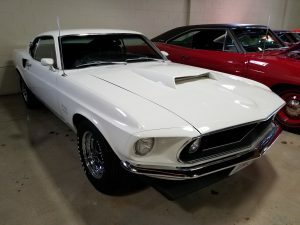 The origin of the Boss 429 came about as a result of NASCAR as Ford was seeking to develop a Hemi engine that could compete with the famed 426 Hemi from Chrysler in NASCAR’s Sprint Cup Series. 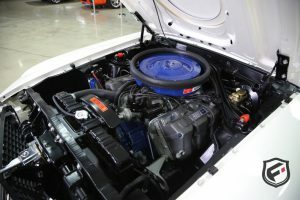 The Boss 429 engine was derived from the Ford 385 engine and used four-bolt mains, a forged steel crank and forged steel connecting rods. 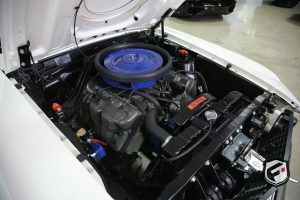 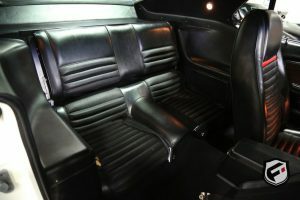 The engine featured aluminum cylinder heads, with a modified Hemi type combustion chamber which Ford called „crescent“. 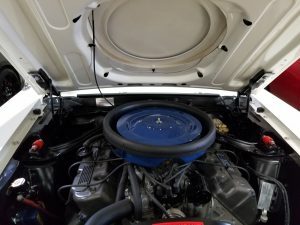 These heads used the „dry-deck“ method, meaning no head gaskets were used. 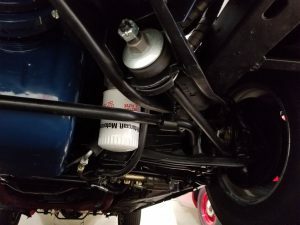 Each cylinder, oil passage and water passage had an individual „O“ ring style seal to seal it tight. 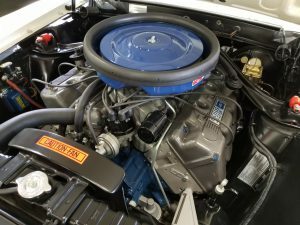 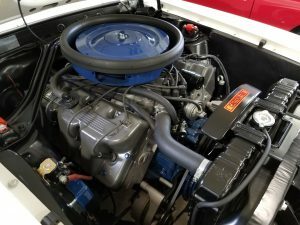 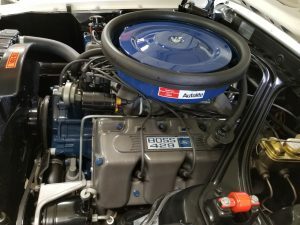 The Boss 429 engine used a single Holley four barrel carburetor rated at 735 CFM mounted on an aluminum intake manifold and an hydraulic lifter camshaft. 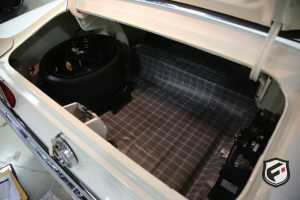 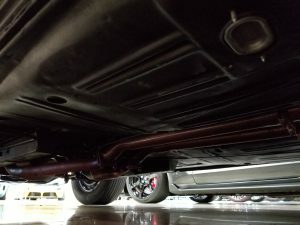 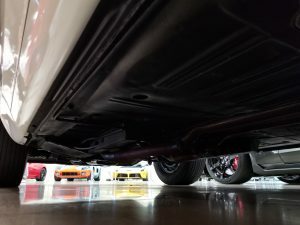 The battery was repositioned to the trunk and a stiff 3/4″ sway bar was added to rear end to improve handling since the car was nose heavy. 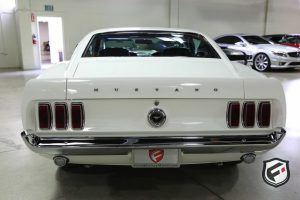 This was the first Mustang ever fitted with a rear sway bar, and it notably handled much better than other big-block Mustangs of the time, making it a very capable track car. 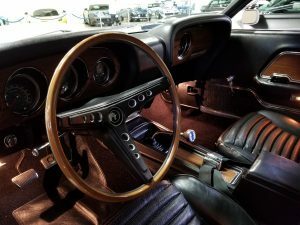 It came fitted with an 8,000rpm tachometer, and AM only radio. 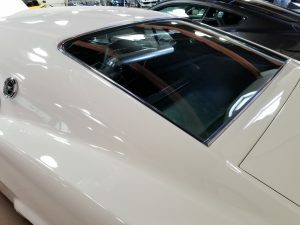 In addition, a hole was cut in the hood, and a manually controlled hood scoop was added to these cars. 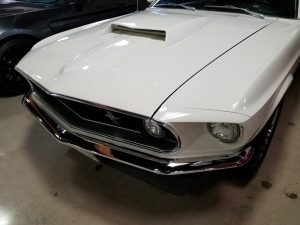 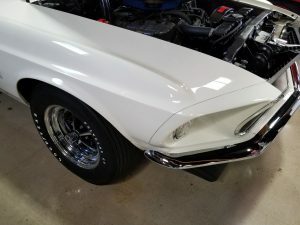 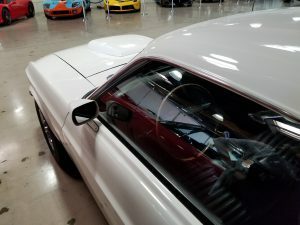 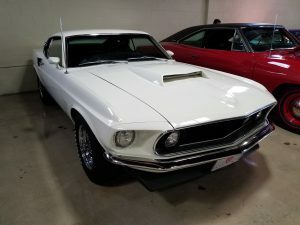 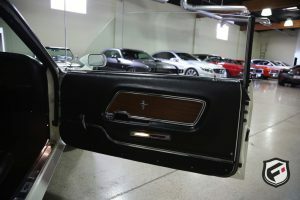 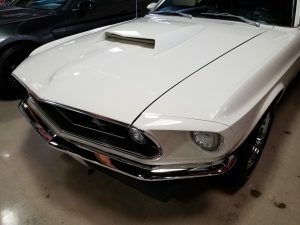 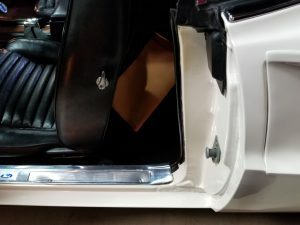 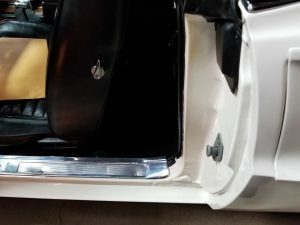 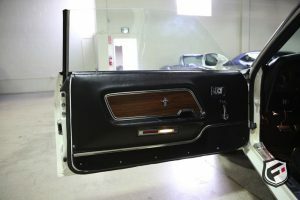 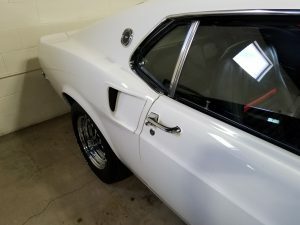 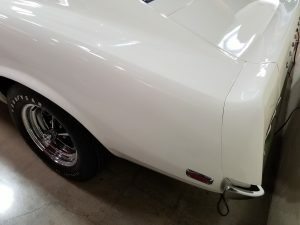 Other features included a front spoiler that was shallower than the Boss 302 spoiler, color keyed dual racing mirrors, and an engine oil cooler. 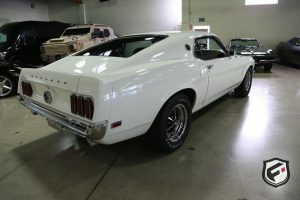 It was also equipped with a 3.91 ratio rear axle with a „Traction-Lock“ limited slip differential. 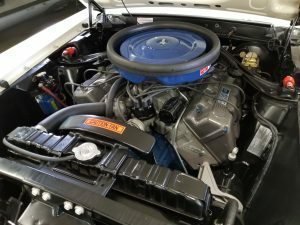 The cars were rated very conservatively at 375 HP and 450 lb⋅ft of torque. 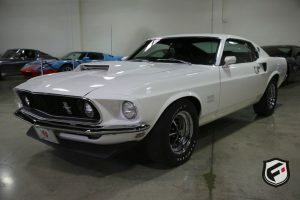 Actual output over the years was tested and stated to be well over 500 horsepower. 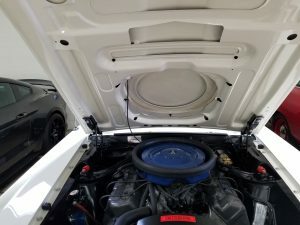 The manufacturers and dealers only listed 375 HP because of legal issues and rising insurance costs so customers would be lured into buying these cars without the stiff fees from an insurance company. 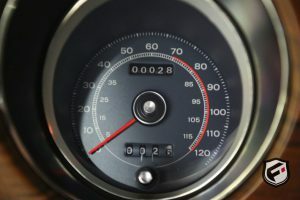 Despite the high horsepower and torque ratings, the car was at home in the high RPM range although it is limited to 6,200 RPM, it is said to be able to rev up to 9,000 RPM for extended periods of time, which is impressive given the engines massive 7.0L displacement. 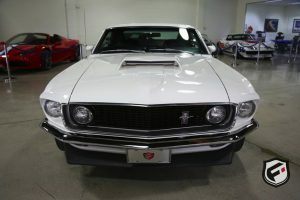 The BOSS 429 featured a toned down exterior, as compared to other Mustangs of the era in that the only external identification of the car were the Boss 429 decals on the front fenders and unique hood scoop which to this day is the largest hood scoop ever used by Ford. 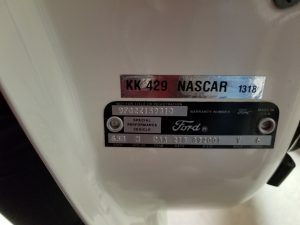 To show just how special these cars were, they were given special NASCAR identification that was placed on the driver’s side door. 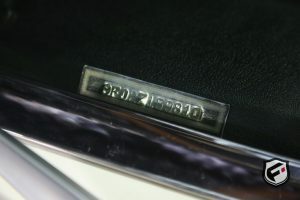 Each car was given a „KK“ number which stood for Kar Kraft. 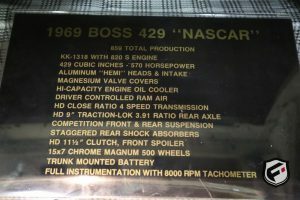 KK #1201 was the first Boss 429 and KK #2558 was the last Boss 429 made. 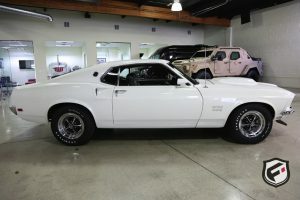 All BOSS 429s were manual transmission, and there was no air conditioning available due to the size of the engine. 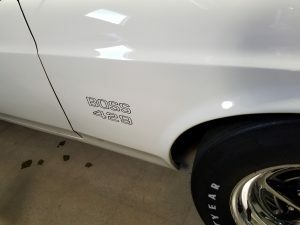 Some early cars were known as „S“ code cars and as such had a slightly different engine. 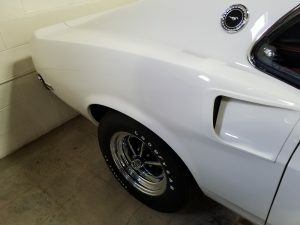 These cars had magnesium valve covers, NASCAR style forged internals, nearly no smog or emissions equipment and are said to be more powerful than the later „T“ and „A“ code engines which had the emissions related equipment to satisfy government regulations. 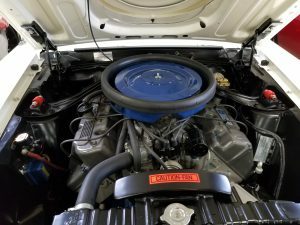 This amazing example is Number KK1318, #117 of the 859 produced and is an „S“ CODE WITH THE NASCAR INTERNALS AND HIGHER HORSEPOWER OUTPUT. 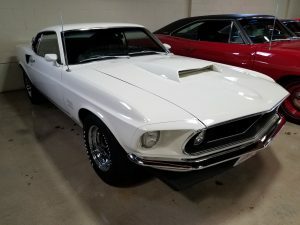 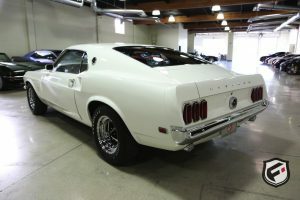 Finished in Wimbledon White with Black Deluxe Interior, this beautiful 429 has only been driven 28 miles since restoration and has been stored in a Mustang Museum.